At Dartmouth Food Festival you can dine at a pop-up event, watch demos from local chefs and participate in tasting seminars. Or simply shop, taste, eat and drink your way around this popular maritime town, soaking up the convivial atmosphere as you go. If you’re looking for an autumn foodie break in Devon, head to Dartmouth for this annual food festival by the sea. The 3-day event conveniently coincides with the half-term holidays and is designed to be fun for all the family. We think it’s simply one of the best food festivals in the UK. You’ll be in foodie heaven as you taste and discover the delicious food and drink for which the South West is renowned. Don’t go home without trying the mouth-watering fish taco from Rockfish washed down with a glass of local Devon fizz. If you want to explore further afield, there are fantastic attractions nearby including Sharpham Vineyard and Riverford Farm Restaurant. A short boat ride away along the River Dart, you’ll find Greenway, the former holiday home of Agatha Christie. It is now managed by the National Trust and is a delight to visit especially if you stop for a Devonshire cream tea. Make a date in your diary for this annual three-day festival. In 2019, the Dartmouth Food Festival runs from 18-20 October. The popular event started over 17 years ago and takes place all around the town. You’ll see stalls and events in marquees along the quayside, in Dartmouth’s historic buildings and market, in restaurants including the renowned Seahorse, and in gardens and boat showrooms. The festival programme changes each year and is packed with creative and fun ways to showcase the best of the region’s food producers and local food champions. There are usually over 100 exhibitors taking part. Speak to Riverford Farm about ordering one of their fantastic organic veg boxes, enjoy an ice cream from the Dartmouth Ice Cream Company or try the succulent meat smoked over an open fire from Piper’s Farm. You could even start your Christmas food shopping early by buying your Christmas pudding from Figgy Puddings. We love the excellent boxed gifts from Godminster Cheese. Check out the Bloody Mary gift set and the gorgeous heart-shaped wax-coated Cheddar cheese. Themes for the drinks seminars in previous years have included ‘Cocktails and Crab’; a cheese and wine tasting session hosted by the Sharpham Estate near Totnes and ‘Thinking Pink’, a tasting seminar devoted to the best rosé wines produced in the South West. After a long day tasting, shopping and sampling, relax with a local tipple in the festival bar overlooking the River Dart. Each year the bar features different South West drinks producers such as the award-winning Pebblebed Vineyard in Topsham; Tarquin’s gin distillery from Cornwall and the Bridgetown brewery in Totnes. Local, regional and nationally known chefs such as Angela Hartnett participate in the festival programme and you can see them in action at restaurants throughout the town and on the festival stage. Local food heroes include Mitch Tonks who in 2008, opened The Seahorse restaurant in Dartmouth and Mark Hix who set up Hix Oyster and Fish House in nearby Lyme Regis. There’s usually plenty of opportunity to improve your cookery skills – perhaps learn how to dress a crab or filet a fish. There are special cookery classes for children, too. Alternatively, sit down at ‘Eat Your Words’, one of the highlights of the festival, where renowned food journalists, writers and experts in their field chat about food topics that whet their appetite. Past topics have included foraging in Devon hedgerows and a history of the West Country pasty. If you’ve still got an appetite in the evening, go to a pop-up supper evening hosted at the excellent hotels, restaurants and cafés in the town. The highlight is usually a special dinner at The Seahorse restaurant, one of the top 100 restaurants in the UK according to the National Restaurant Awards. If you’re not lucky enough to get a reservation, go for a cheeky and very delicious cocktail in their cosy bar. For a taste of the sea, cook this delicious festival dish we tasted from the team at The Bistro in Fowey. They combined mussels, squid, octopus, samphire and cherry tomatoes and sautéed them with garlic, coriander, chilli and lime. Serve with olive focaccia bread. 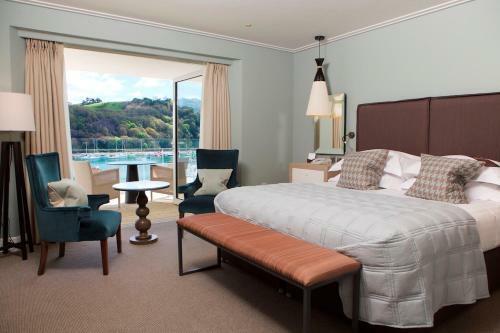 The Dart Marina Hotel offers stylish rooms and a luxury spa overlooking the River Dart. For self-catering accommodation in Darmouth, this lovely apartment in Warfleet is in a peaceful location just a short walk from the centre of town. Doggie heaven. Lots of pals to play with and as Dartmouth Food Festival is mostly outside, you can take me along with you.